Crows: Symbol of Bad Luck? Or Intelligent Birds? Crows are common black birds well known for their intelligence. They are found all over the world. Some crows are solitary while others stay in groups. A group of crows is called a murder. When a crow dies, the murder will surround the deceased one. This behavior can be interpreted as a way of mourning their dead and also to find out what killed them. There are nearly 40 species of crows in many different sizes. An American crow measures around 17.5 inches (45 cm). A fish crow is 19 inches (48 cm). 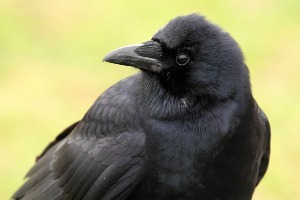 American crows and ravens are different in multiple ways. Ravens are bigger, their voices are hoarser, and they have heavier bills than American crows according to the University of Michigan's Animal Diversity Web (ADW). The common raven is much larger and is 27 inches (69 cm). They eat small animals such as mammals, amphibians, mollusks, worms, and other types of birds. Crows sometimes have been found eating in garbage cans according to ADW. These birds are extremely smart and some things they are known for their problem-solving skills and communication skills. Crows even play an important part in mythology. In Greek mythology, crows are seen as a symbol of bad luck. But their amazing skills and intelligence shows that they are not bad luck.